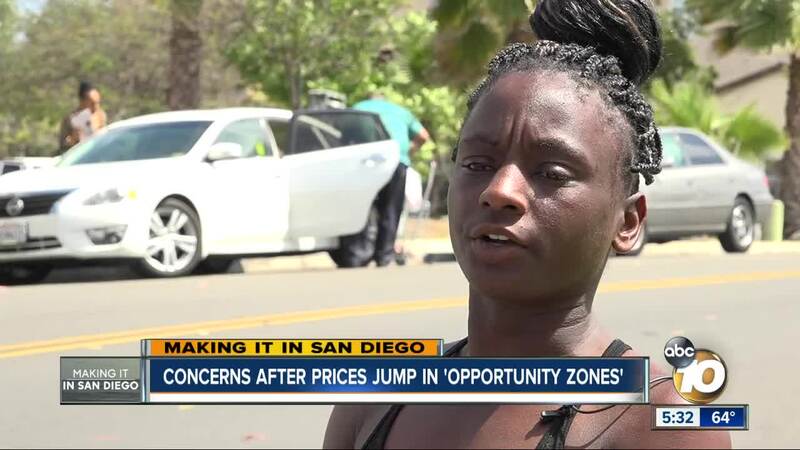 SAN DIEGO (KGTV) - The government is sweetening the deal for investors who put their money into San Diego's most under-served neighborhoods, but the offer could be having a negative effect on the people who live in them. A new study from Zillow says prices in so-called opportunity zones grew 20 percent in a year after they received the government designation. That designation, part of 2017 tax reform, offered investors capital gains tax breaks for investing in the areas, which the IRS deems "economically distressed." San Diego County has about 30 of these zones , most of them concentrated in the city of San Diego's inner core. Zillow says the Colina del Sol neighborhood near City Heights, parts of Golden Hill and University Heights are the areas that could see the most investment. "It's been expensive to live here, but it's expensive to live anywhere," said Tomi Barnett, who lives in Colina del Sol. "It's starting at $1,200 or $1,300 (a month) for a one-bedroom." The steep price increases have led to concerns that the opportunity zones could ultimately price people out of their own neighborhoods. Erik Tilkemeier, who does economic development for the City Heights Community Development Corporation, said his group is working with officials to make sure the investments also benefit the community. "Our sidewalks are deplorable in a number of neighborhoods, the walk-ability is not what it should be," he said. "The challenge is all of those same improvements tend to cause gentrification." Tilkemeier added that the government shut down earlier this year delayed getting answers to some key questions on the program.